The Carlo products ensure high accuracy & performance, durable finish standards, and reliable performance. Offered at competitive prices, these castings are in accordance with the defined quality standards. Wherever plastic granules are conveyed and processed, capacitive sensors monitor the levels in pipes and in silos or through sight glasses in loaders on injection machines, extruders and blow molding machinery.Electrostatic discharge (ESD) often occurs in the plastics industry and in applications where the material is being transported in plastic tubes. 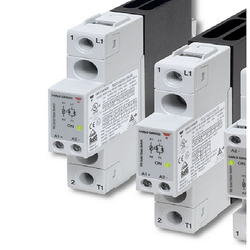 Thanks to Tripleshield TM technology, the Carlo Gavazzi capacitive sensors are protected against disturbances caused by high ESD up to 40 kV. Featuring EMC and ESD immunity, Carlo Gavazzi sensors - EC and CA series - detect the level of plastic pellets in the hopper whilst withstanding environmental interference.Mounted on the plastic sight glass or in the hopper containing plastic pellets for point level detection, they can also be mounted directly in the metal hopper. The capacitive sensors CA18/CA30, CLL series, present specialized and optimized features for level detection in plastic applications. Any adjustment is easy to make by means of the single-step teach-in function. The sensing face (flush mounted) can withstand temperatures up to 120°C.Additionally, heaters for the drying of the plastic granules can be switched withRM1A or RGS1A solid state relays. An alternative solution is the RGC1A series, which provides solutions ready for use, as the heat sink is integrated with the solid. Looking for Components For Plastic Machinery ?